While the main purpose of this thing is entertainment, it is actually quite possible to learn useful information from reading it. Especially if you are an aspiring bigamist. The latest non-reader to pay the price is a 49-year-old South Carolina man (let's call him "Darnell," because that's his name) who has been accused of having four wives at the same time. (He has actually had five wives, but he did divorce one of them.) Under South Carolina law, "[a]ny person who is married who shall marry another person" is guilty of bigamy. Any person who is married who shall marry four other people should clearly be guilty of quadrigamy, but South Carolina has not provided for this situation so I guess it'll be three charges of bigamy in his case. Also, any person who is married who shall marry another person and then shall post the new wedding pictures on Facebook is guilty of stupidity. 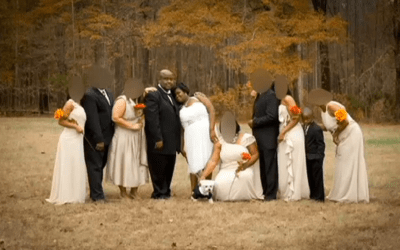 If Darnell had been a reader of Lowering the Bar, he might have avoided this, because it is by no means the first time that making additional-wedding photos public has caused a serious problem. See Facebook: Bad News for Bigamists" (Mar. 29, 2011) (reporting a similar case in Michigan); see also "Wedding Photo Tips for Bigamists" (May 4, 2010) (same concept but involving the local newspaper). Bigamists could also learn that there is no exception simply because one or more of the marriages may have taken place in Vegas, although Darnell doesn't seem to have tried that one. See "Note to Self: 'What Happens in Vegas, Stays in Vegas' May Not Be Legally Binding" (Mar. 30, 2006). That case involved a female trigamist, although her lawyer was to blame for the bad argument. Or maybe Darnell does read this blog, or used to, and was hoping to be mentioned in it by one day beating the previous record for number of igamies. See "Bishop Says Octuple Bigamy Due to 'Misunderstanding'" (May 22, 2007). Wait—no, according to the sheriff, Darnell also said that "he thought maybe it was a misunderstanding," so if he did read the 2007 post he learned nothing. He did get himself mentioned, of course, but really just because of the Facebook thing. The sheriff speculated that there could still be more wives out there. The investigation continues.